In 1987, a trio of scientists published research suggesting that mankind's most recent common female ancestor lived approximately 200,000 years ago. All humans alive today, they postulated, descended from this one woman, Mitochondrial Eve. This Mother's Day let's take a closer look at the most distant known ancestor on my matrilineal line. Don't worry, we're not going back 200,000 years. 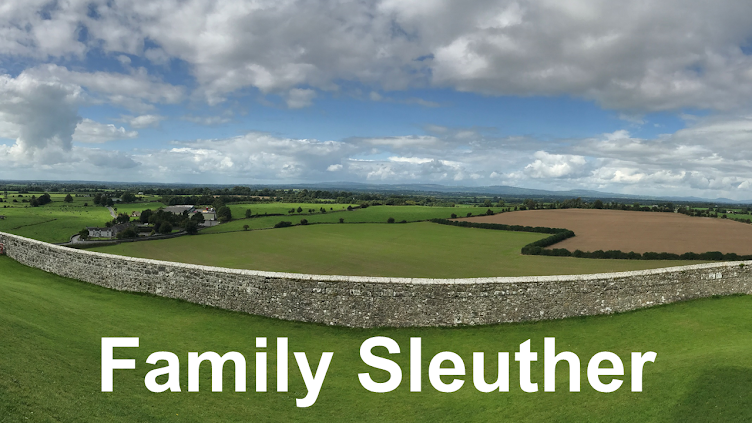 This blog isn't lifted from one of those spurious member-created Ancestry.com family trees that cobbled together a pedigree back to Adam and Eve (that post is slated for next week). This is a snapshot of Mitochondrial Mary. 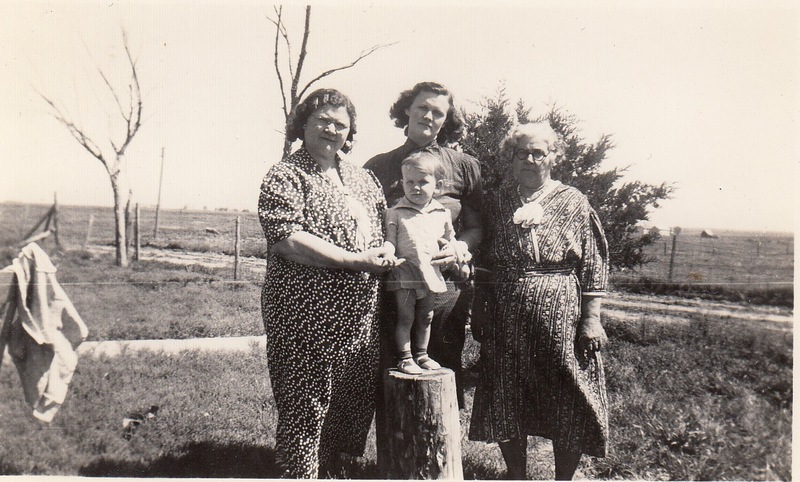 Mary Jane (Andrus) Bair was my third great-grandmother on my direct maternal line. With her husband Michael Bair, she had 16 children. Sixteen! I think it's fair to say she knew something of what it was to be a mother. Mary Jane (Andrus) Bair was born December 9, 1862 in Bradford County, Pennsylvania. Her obituary explains that, "When she was three weeks old her mother died, leaving her to kindly relatives, Mr. and Mrs. Jared Beardsley, who adopted her as their own on January 3, 1863." I've yet to locate an official record of that adoption and the identity of her birth mother remains unknown. It's unclear to me whether Mary Jane ever knew the name of her biological mother. She is, for now, the last known lady on my direct maternal line. Learn more about that mystery in An Unknown Matriarch Cloaked. 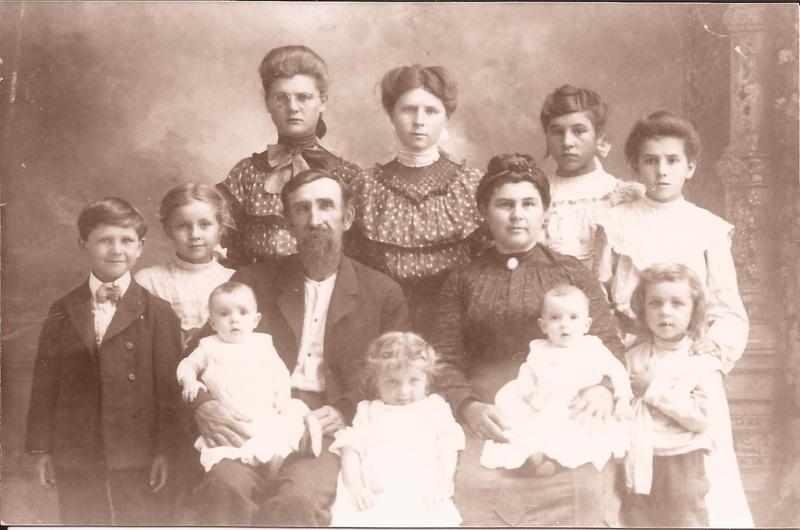 The Beardsley family moved to Iowa in 1864, which is where Mary Jane met and married Michael Bair on May 14, 1878. From a May 1928 Plainville Times article recounting their Golden Anniversary celebration, we learn that, "Immediately after the Wedding Dinner was served Mr. and Mrs. Bair started to Kansas in a covered wagon and they visited some on the way arriving at the home of D.C. Anthony, June 10, 1878 and he located them on section 19, T.9, R.17..."
To spend your "honey-moon" and many months in a "Prairie Schooner." The poem is a family history gem, retelling their life story in poetic verse. For instance, the poem hints at economic reasons behind the young married couple's decision to leave Iowa for Kansas. And came to sunny Kansas, choosing that state as the best." They were hard workers who toiled with the land while raising a family. As the Plainville Times wrote, "neither Mike or Mary were slothful in business." Their beginnings were humble, the newspaper added, "Where he could get work out he was glad to take his three horses and work for a dollar a day. With that money he bought shorts and corn meal and groceries and once in a while a pair of overalls for himself and a gingham dress for Mary so they could go to church." So they turned about and named you a sturdy pioneer." You'll recall their growing time and all the busy, happy days. The glad-sad time you gave "God-Speed" thought it left you all alone. That left your hearts so lonely, but are waiting 'over there.'" Mary Jane was preceded in death by five of her children who passed away under the age of 14. In an oral history interview I asked my grandmother Marilyn what she recalled of her great-grandmother Mary Jane. "I don't ever really remember a conversation," she said, adding, "I can remember talking with her as a kid, but I can't remember a particular conversation." Marilyn was only eight years old when Mary Jane passed away. and Mary Jane, my 3rd great-grandmother (right). "What I remember of Grandma Bair is she was an invalid. I don't remember when she could be up and about. I can remember when she would be lying in her bed there in Plainville and they had her in a hospital bed, but they weren't metal, it was a wooden bed... The hospital bed was painted white but made out of wood... It was adjustable. This was a long time ago and they didn't have the modern conveniences of the metal beds." Marilyn added, "She had a dinner bell and she could ring it in her room when she needed attention. I remember her being bedfast in that little room." Mary Jane's 1945 obituary shared more about her condition, "Mrs. Bair's last illness had lasted nearly five years, in which she suffered a series of strokes that kept her bedfast. But she was a very patient and uncomplaining person." 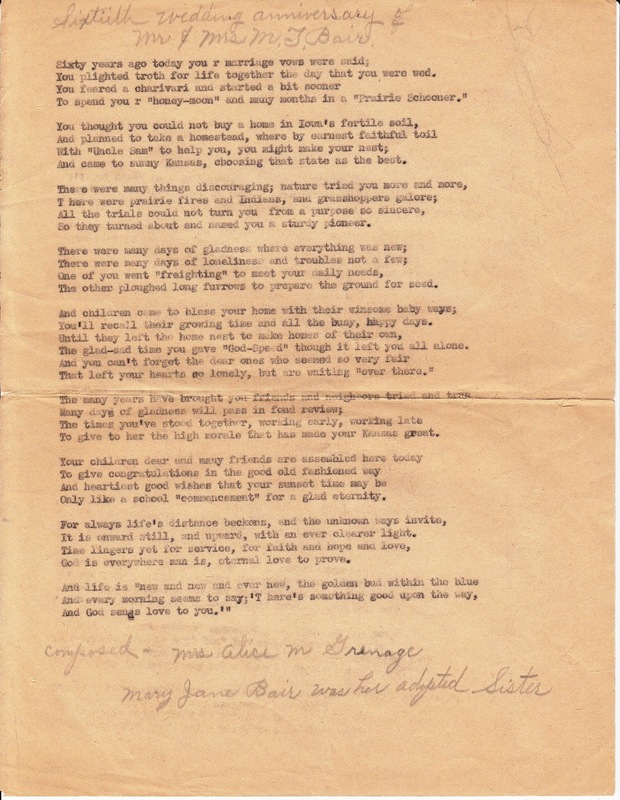 On July 24, 1945, at the age of 83, Mary Jane (Andrus) Bair, who lost her mother when she was just three weeks old and had sixteen children of her own, passed away. She arrived, as her obituary noted, "one more pilgrim at the gates of heaven." Imagine that, 5 years in bed. One more pilgrim at the gates of heaven for sure. Thank you for sharing so personal a story. I hope it was made somewhat bearable being surrounded by her large family. The aunt who wrote the poem had a gift! I thought it was clever tying the "fear of a charivari" (which I've always known as chivaree) to their getting on a wagon right after the wedding dinner. More likely, the wagon train was scheduled, and they scheduled the wedding to take place before they left! She lived the life that we read about in Will Cather. I think you're right about the marriage being scheduled to coincide with the wagon train. 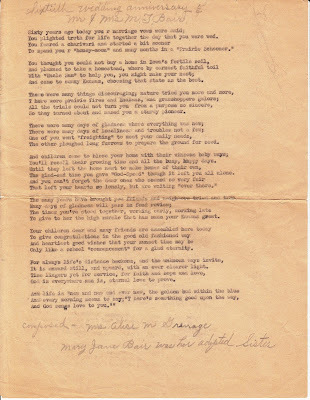 The poem was a recent find in my grandmother's papers. Family history in poetic verse lost in a stack of anonymous papers. That is quite a life story. I wonder if with DNA testing you could locate her biological parents and find out what happened to the father. She certainly was a remarkable woman. Sixteen! I could barely handle two!! If the documentary evidence doesn't turn up, I think DNA is definitely contender for breaking the case (although I'm a bit worried about the community being so tight that the family lines married across each other multiple times). Good luck---and keep us posted! Love that family history poem! It's a family treasure for sure!